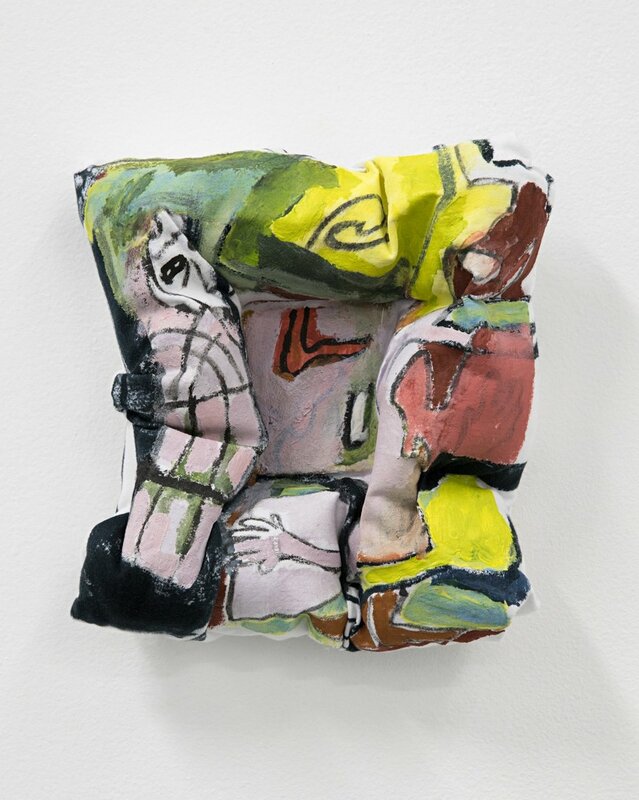 The exhibition features paintings and fabric works by Matt Arbuckle, Sean Bailey, Lucia Canuto, Rafaella McDonald, Jahnne Pasco-White and Laura Skerlj. Formally we have selected works that employ yellow, which symbolically stands as the antithesis of blue. For as Goethe wrote: ‘As yellow is always accompanied with light, so it may be said that blue still brings a principle of darkness with it.’ In Bluets Maggie Nelson wrote, ‘I have been trying to place myself in a land of great sunshine, and abandon my will therewith’. 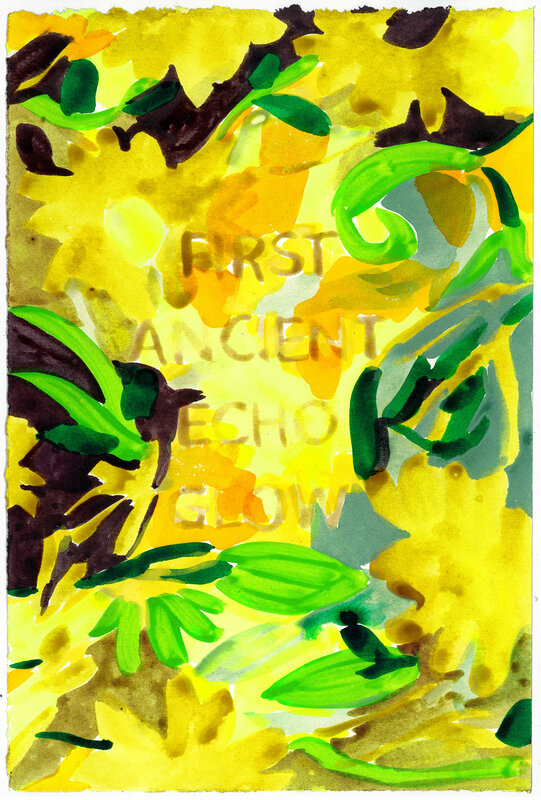 And later: ‘During one particularly despondent New York City winter, I bought a huge can of bright yellow paint at the Hardware store on Allen Street, imagining that I might buoy my soul with its cheer.’ Likewise we look to yellow, seeking its therapeutic warmth and comfort. Matt Arbuckle draws on landscape and photography in works of painting and drawing that are predominantly abstract and ultimately concerned with formalist issues of space, composition and mark-marking. He seeks to disrupt pictorial planes and construct spaces through the layering of fields of colour with bold gestural marks. Matt has held solo exhibitions at Parlour Projects, Hastings, NZ (2018); Tim Melville Gallery, Auckland (2017, 2016, 2015); Daine Singer, Melbourne (2017); BUS Projects (2017); PAULNACHE, Gisborne, NZ (2016, 2014, 2012); Neo Space, Melbourne (2016); Fontanelle Gallery, Adelaide (2015); Brunswick Lake Gallery (2015); Chapter House Lane, Melbourne (2015); Augusto, Auckland (2014); Studio-Baustelle, Berlin (2013) and Holborn Building Space, London (2013). He has participated in group exhibitions at galleries including TANS Martial Arts, Melbourne (2018); Richmond Town Hall Gallery, Melbourne (2017); Hugo Michell Gallery, Adelaide (2017); Daine Singer, Melbourne (2016, 2018); Baustelle Gallery, Berlin (2013,2016); Waikato Museum, NZ (2016); Drill Hall Gallery, Canberra (2016); TCB Art Inc, Melbourne (2016); Hanging Valley, Melbourne (2016); Morrinsville Whare Toi Wallace Gallery, NZ (2015); M Contemporary, Sydney (2015); Fort Delta, Melbourne (2015); Tristian Koenig, Melbourne (2014); Melbourne Art Fair (2014); Sydney Contemporary (2015); 30 Upstairs, Wellington (2014); Studio 40, Auckland (2014); BaumgartenBrandt Rechtsanwalte, Berlin (2014) and High Street Projects, Christchurch (2009). Matt was born in Auckland and currently lives and works in Melbourne. He has been a finalist for the The National Contemporary Art Award, New Zealand (2016) and Wallace Art Awards (2016, 2015, 2014, 2011, 2009). In 2017 he was the winner of The Wallace Arts Trust Vermont USA Award 3 month residency. His work is held in the Chartwell Collection, Auckland Art Gallery, Toi o Tamaki and James Wallace Arts Trust. 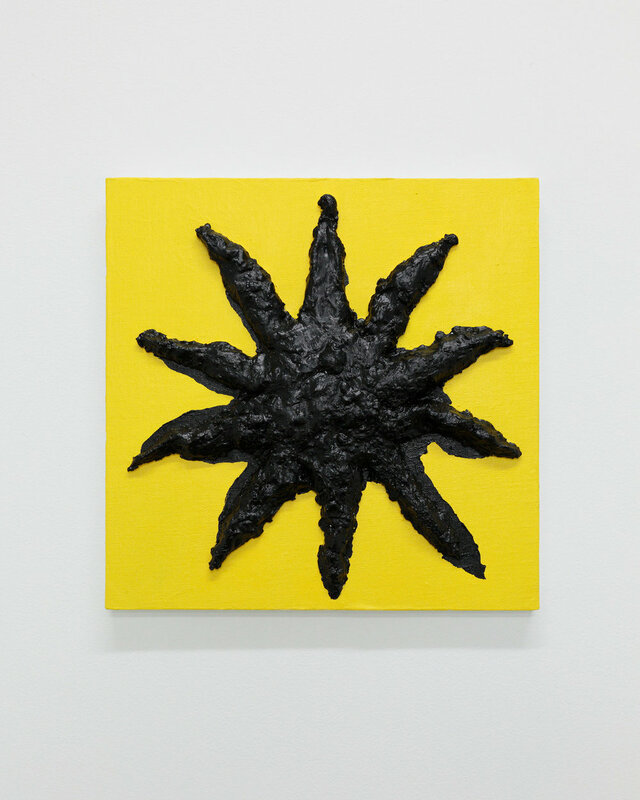 Matt Arbuckle is represented in New Zealand by Tim Melville Gallery. Sean has had solo exhibitions at Sydney Contemporary; RM, Auckland; First Draft, Sydney; and in Melbourne at Daine Singer, Gertrude Contemporary, Neon Parc, West Space, TCB, Joint Hassles and Clubs Project Space. He has participated in group exhibitions at University of Queensland Art Museum, Brisbane; Gambia Castle, Auckland; Special, Auckland; Amsterdam Biennial; Darren Knight Gallery, Sydney; CAST, Hobart; and in many Melbourne spaces including: Spring 1883 Art Fair, Gertrude Contemporary, Sutton Project Space, Hell Gallery, Bus, Utopian Slumps, TCB and SEVENTH. As a musician he is known for playing in groups including Paeces, Wasted Truth, Vivian Girls, Lakes, TOL and TAX as well as running the private press label Inverted Crux. He has a BFA (2005) from the Victorian College of Arts and was a studio artist at Gertrude Contemporary (2013-2015). Lucia Canuto is interested in testing the width and weight of symbols in an active, visual form of language making. She is a multi medium artist, currently focussed on screenprint, ceramics, jewellery and writing. Lucia graduated from the Victorian College of the Arts (2014) and was awarded the Ursula Hoff Award for excellence in printmaking. 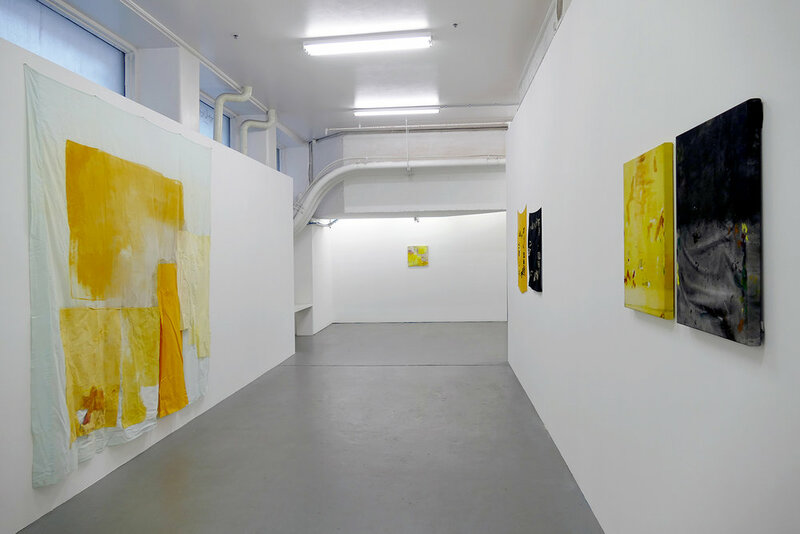 She has exhibited at the Mokuhubga Conference in Tokyo, Japan (3331 Artist Space) (2014), a solo show The Napier Hotel (2015), and collaborative exhibition with Sean Bailey at The Emerald Bakery historical Site (2016). In 2017 she had work published in the WAR bulletin (Women’s Art Register, Melbourne) and The Chapess Zine (Synchronise Witches Press, UK). Lucia currently lives and works in the south of Italy, where she will be running the second Summer Artists Residency with a group of international emerging artists and writers in 2018. Rafaella McDonald has a painting and sculptural practice and works across gallery settings, public spaces, on clothing and in collaborative performance. 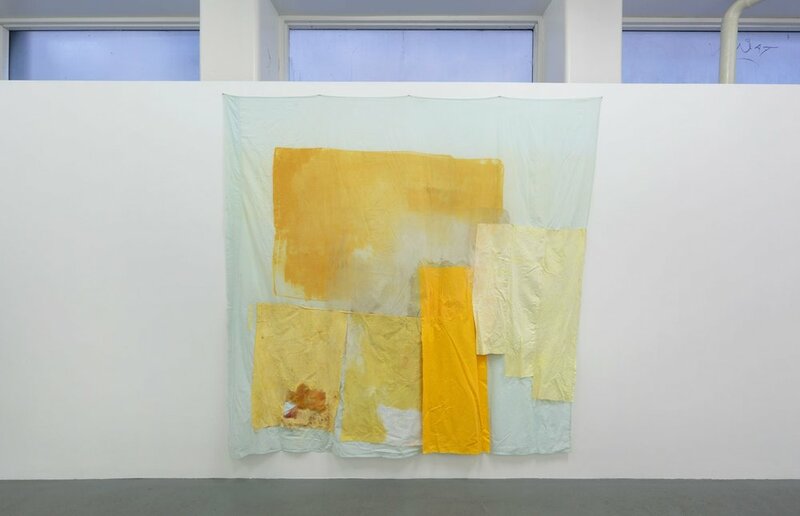 Her practice is concerned with the gestural elements of materials, documenting playful and joyous interactions between materials and the body as moments of agency amongst precariousness. Recent exhibitions have included a solo show Rhyming Stance at TCB Inc, Real Life Fantasies at West Space, Saturn Returns at Fort Delta and Pose Like This, a large-scale commission for The Substation with Emma Collard. Her work has been included in the biennial Next Wave Festival for emerging artists, the National Gallery of Victoria collection, and she has created large-scale mural commissions for the Melbourne Metro Rail Authority at City Square Swanston Street, Shepparton Art Museum and the City of Stonnington. In 2017 she was the recipient of the Midsumma Art Prize Award and received a Vic Arts Grant to undertake a month long residency in Los Angeles. Rafaella received First Class Honours at the Victorian College of the Arts (2015) and hold a Bachelor of Creative Arts from Melbourne University (2009) Her textile work has been included in publications such as Hessian Magazine and The Craft Companion (Thames and Hudson). 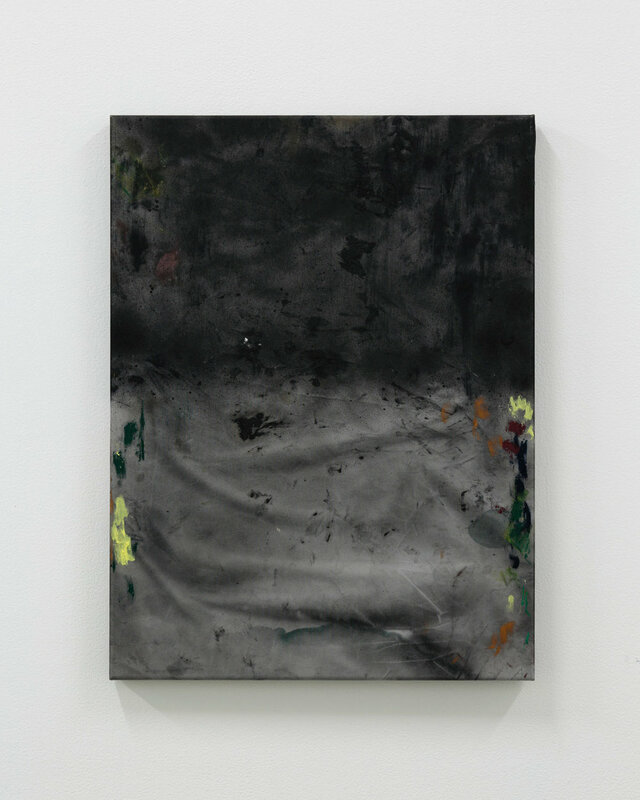 Jahnne Pasco-White’s expanded painting practice considers the intersections between temporality and materiality. Her work is characterised by the labouring of delicate supports. Specifically, she is interested in the layers of authorship that are variously evidenced and concealed by the artist’s mark-making, as well as their continual processes of decay and renewal. Jahnne's work has been exhibited in solo exhibitions in: New York, (910 Lofts); Sydney (Daine Singer at Spring 1883); Auckland (Artspace); and Melbourne (Daine Singer, Testing Grounds, Bus Projects, Rearview, Long Division Gallery, C3, Counihan Gallery, Seventh, Brunswick Lake). She has participated in group shows in: New York (Pulse Art Fair, Honey Space Gallery); Leipzig, Germany (Westpol A.I.R. Space, LIA, Spinnerei); Auckland (Artspace); and in Melbourne (The Honeymoon Suite, Assembly Point, Town Hall Gallery, Incinerator Gallery, Slopes, Brunswick Sculpture Centre). Jahnne has been awarded a 2018 scholarship at the Art Gallery of New South Wales’ Moya Dyring Memorial Studio at the Cité Internationale des Arts in Paris. She has completed residencies in Germany, Italy, Iceland, New Zealand, and Australia, including at LIA in Leipzig, the Rome Art Program, and the Icelandic Nes Artist Residency. She holds a BFA in Drawing from RMIT University (2010) and First Class Honours (2015) from the Victorian College of the Arts. Jahnne currently lives and works on Wurundjeri land, in Australia. Laura Skerlj’s practice explores the energetic potentials of painting, with an focus on gesture, colour, drawing and aggregate methods. Reflecting on personal references, she combines imagery in a collage like manner. This has included allusions to popular culture, nature, cosmic forms, text and patterns. Through a process of cutting, pasting, drawing, layering and painting, these motifs are reconfigured; in this way the chosen material subsumes and changes the imagery to generate abstract images. Through these processes, Laura is interested in a pictorial space that is elastic, abbreviated and open-ended. Laura graduated with a Master of Fine Arts by Research (2013) from the Victorian College of Arts. She has since exhibited widely in commercial, community and artist-run spaces, including exhibitions at Gallery 9, Sydney; Alaska Projects, Sydney; Fort Delta, Melbourne; Tristian Koenig, Melbourne; Michael Reid, Berlin; LON, Melbourne; Artereal Gallery, Sydney and the Linden Centre for Contemporary Art, Melbourne. She has been included in survey exhibitions on abstract and landscape painting, including What’s Happening Here?, Town Hall Gallery, Melbourne; VIEW, Artereal Gallery, Sydney and the John Leslie Landscape Painting Prize, Gippsland Art Gallery, Victoria. In 2016 she curated an exhibition of contemporary painting that explored aggregate methodologies (Elastic Field at Strange Neighbour, Melbourne). Laura also writes about contemporary art for print and online, with recent publications in ArtAsiaPacific and Artlink magazine.